The night went by with little sleep in the car. I turned on the engine a couple of times when it got too cold and put on the heating to not freeze. Temperatures fell to -6 Celsius, then -8 in the morning as the first light appeared. 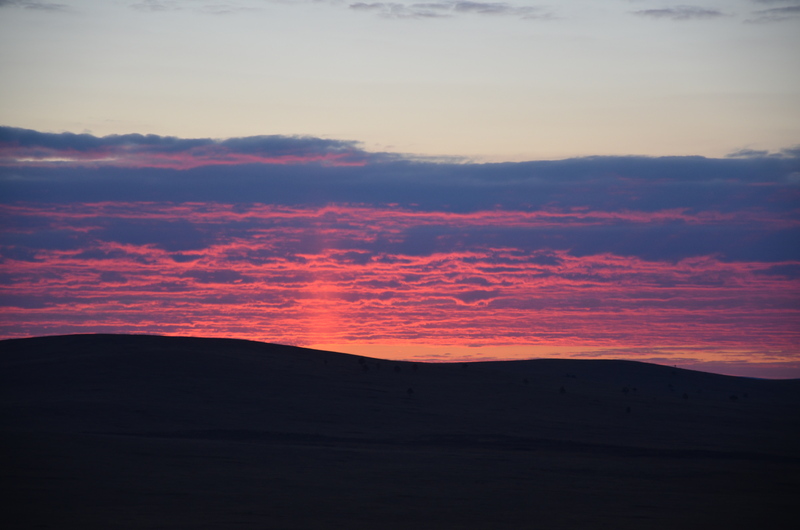 At 07:00 the sun rose behind a hill, and the day started with a breakfast in the blue Landcruiser. It was nice and warm, the coffee good, and soon the horrible night was forgotten. The sunlight warmed us quickly, then Andreas and I went to see some Mongol farmers nearby. The night before a guy on a motorbike had come to check their car and told them to visit them in the morning and get a truck to pull us put. When we arrived a woman was cooking and working in the house, the men were milking the cows. She offered us tea, bread and a thick sour cream from a big bucket under the floor, where she kept the reserves (potatoes, onions, cole and the like). The wooden house was very simple, just one main room with everything in it (bed, kitchen, table, TV, Radio, desk, closet), a big oven in the middle, and cheesy decoration of tables full of fruit, food and booze. I had seen something similar hanging in a house in the Pamirs. We sat and waited, until the men came in with two 50l canisters of fresh milk. The youngest, probably the son, had breakfast. The father started to operate a machine by hand that separated the sour cream from the milk, while the woman poured the milk into it. And another guy helped with the tanks and refilling milk. They had a telephone connected to their satellite TV, the woman did some calls and then handed Andreas the phone to talk to a guy who spoke some English. Good news: a “truck” would come in 2-3 hours to get us out of the frozen morass! It was 09:30 by now, we decided to use the time to prepare the operation. We unloaded weight from the Swiss Landcruiser, prepared the tow ropes, metal tracks, tools. I put my tent in the sun to dry, I had packed it the day before in the rain and it was still wet. One guy from the farm came to check us out, helped a little with the unloading, and once he had seen what was going on, drove his bike back to their place. As we were working in the sunshine under the bright blue sky at pretty warm temperatures (the ideal morning to start a day after a night camping! ), another guy appeared out of nowhere and started to check our situation and talk to us with gestures. We had no idea who he was and where we came from. He suddenly started to dig a hole on the side of my car towards the Landcruiser. Andreas and I watched, to understand what he planned. He wanted to use the 30cm deep hole to dig one of the metal tracks in, fix it to the winch, cover it with mud, put himself on top and so dig the Landcruiser out. It was a completely stupid idea given the wet ground, but somehow we tried it, and obviously it didn’t work, the winch dragged the track out of the mud again and the car didn’t move a cm. Just in time to avoid a loss of face for our self styled would-be saviour, a vehicle appeared on the horizon. Our “truck”! As it came closer, we realised a tractor, not a truck came speeding towards us. Well, it was what we could get out there. Two guys jumped off it as it reached us, we briefly shook hands and got to work immediately. My car got out of the mud in a few minutes, the tractor just dragged me out a couple of meters and I was safe. A ridiculously easy operation, just a few meters separated me from safe ground. Then we tried to free the Landcruiser, and this was quite a different game. Towing from the front didn’t move it at all. From the back it budged half a meter, but we couldn’t get it out of the mud. Again from the front the same situation repeated, the car was still stuck. The sun by now had unfrozen the iced water, and with so many people and vehicles moving around, the whole area had mutated to one big swamp. My feet were completely wet and cold as I had sunk knee-deep into the water a couple of times already. I was covered in mud and probably animal excrements in various crusted and fresh layers. The Mongol crew wanted to raise the Landcruiser to put wood under the wheels. I drove to the farm with one guy, got two large trunks and towed them to our operation ground. With these and other trunks we recovered from the swamp, plus help from Andreas’ huge car-jack, we raised all four wheels of the car one by one, and put logs under them, dug some mud out of the way, and started another tractor towing attempt. And this time, at the third pull, the Landcruiser moved and got out of the swamp onto firm ground. A big cheer went through the entire team. Both cars were safe! 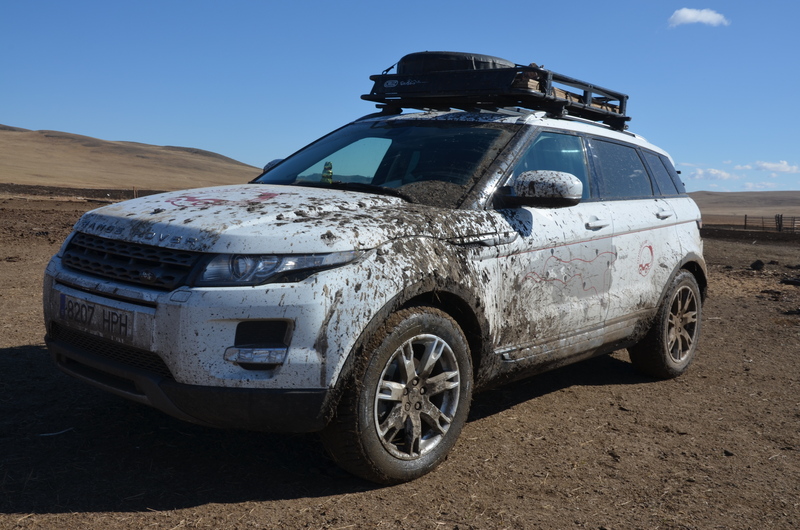 We started to pack, the Mongols got the tractor ready for takeoff, then we all had two toasts with the only spirit at hand, an Armenian cognac I still had in the Evoque. The tractor guys got 120.000 MNT, and left happy. Andreas, Karin and I were hungry. We got chairs, camping table and all our picnic stuff out and devoured the food. During lunch temperature fell, and we started to pack quickly. There was so much stuff lying around, the equipment, their baggage. Everything had its place in the Swiss organised vehicle, and I had to re-pack my car to a big extent too. 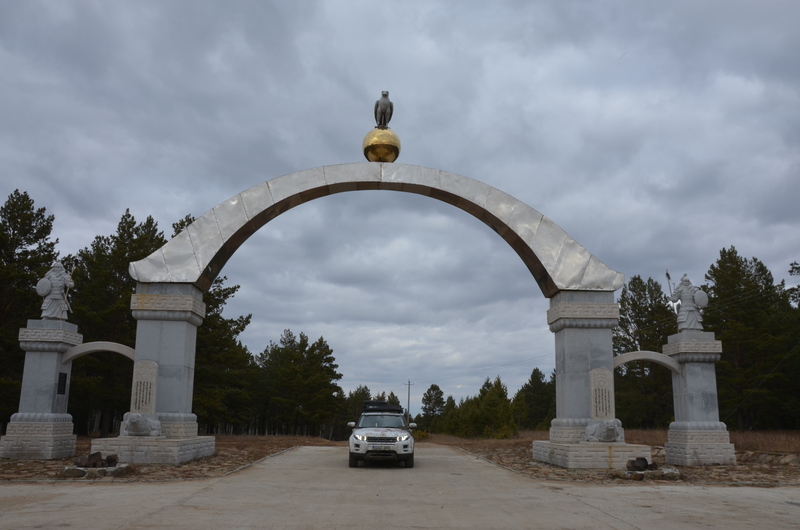 Almost 24h after we got stuck, we hit the road again and drove quickly to the entrance of Dadal, the town where Chinggis Khan was supposed to be born. A huge gate welcomed visitors. 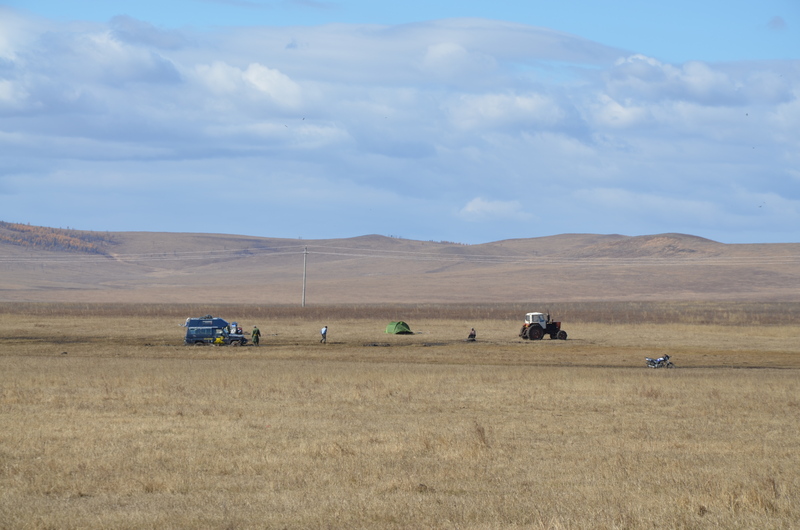 At this point it was time to split up, they would drive into town, while I wanted to get back to the main road asap and from there to Ulaan Baatar. As I left them, it took me an hour to calm down to the fact that I was driving alone as I had done before, and that if anything happened, I would have had to fix it by myself. 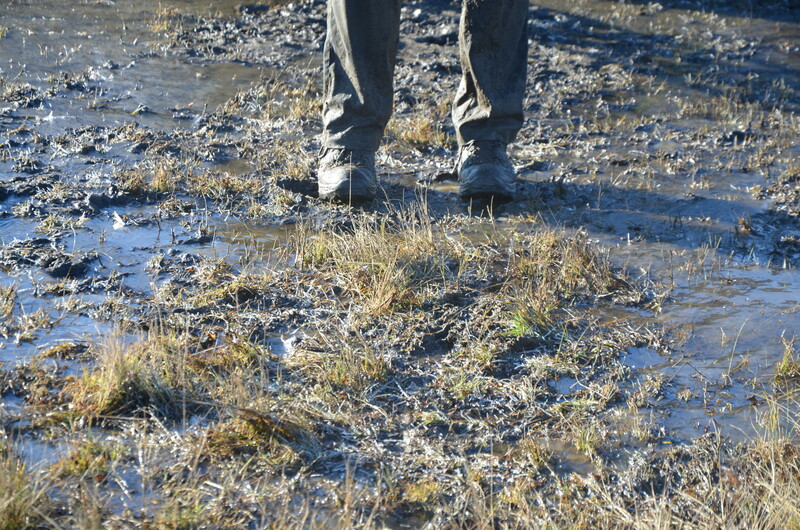 I was terrorised by the sight of the smallest stretch of mud, and at the first major river crossing decided to find another site to pass it: there was plenty of mud on both sides of the water. 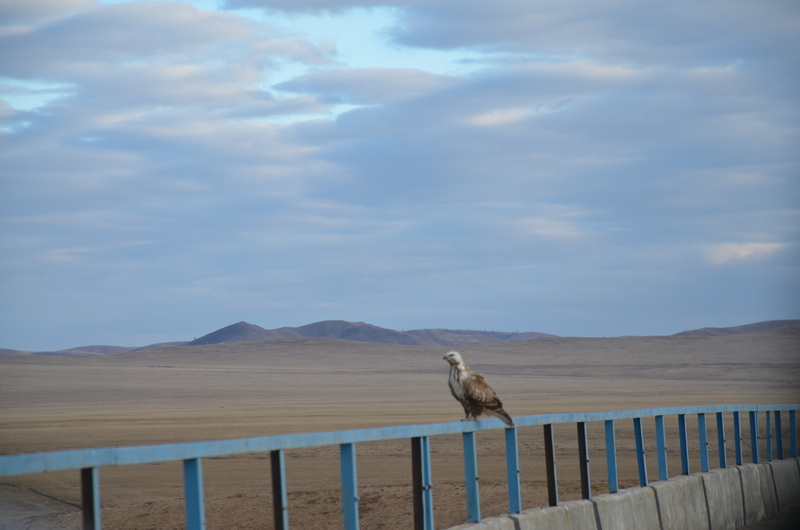 But the road got better, was mostly dry, I passed several bridges (something unseen in the steppe so far around here), and made good progress. My GPS app navigated me safely towards the main road. I fuelled up at the first big town I crossed, and got onto what the paper map marked as a bigger road and not just a track in the steppe. There was only one difference to the previous tracks: this new and supposedly bigger one was full of huge potholes and horrible to drive on. My hopes to reach UB by night went bust. An hour out of town the sun started to disappear on the horizon, in an amazing red fire under the clouds. I decided to find a place to camp for the night, and soon after left the track, drove up a hill and pitched my tent. In the last daylight, I cooked some spaghetti all’arrabiata with some ingredients still left from Europe (fiery peperoncino from Sicily, and olives from my parents’ garden on the Bolsena lake), since there was no wind and I could use the gas stove. What a meal! Tired I fell into the sleeping bag, covered myself with all blankets I had, put my down jacket and vest on, plus the super-warm slippers from the Pamir artisan shop. In cozy warmth and total silence of the night I fell asleep, exhausted from the day. Really exciting stories. Enjoy Mongolia!